Barry Meisel scanned the list and his eyes lit up. A veteran collector approached him late last year with the opportunity to purchase 90 vintage, game-worn hockey jerseys and the inventory was intriguing. There were a few gems. A Montreal Canadiens sweater worn by Hart Trophy winner Aurel Joliat in the Howie Morenz Memorial Game at the famed Forum on Nov. 2, 1937. A game-worn Gordie Howe jersey from the WHA’s New England Whalers. And Bobby Clarke’s well-worn sweater from the season the Philadelphia Flyers won their first Stanley Cup in 1973-74. But one item in particular caught the eye of Meisel, who quit his job as a sportswriter in 1997 to turn his passion for sports memorabilia into a career. Meisel wondered whether the fabric of Maple Leafs lore had fallen into his lap. There was a Darryl Sitter white Toronto Maple Leafs sweater from the 1975-76 season. Could it be? The sweater Sittler wore that Feb. 7, 1976 night when he set an NHL record with 10 points against the Boston Bruins had not surfaced publicly in 42 years. Collection in-hand, it was time for Meisel – president of MeiGray Group, one of the premier jersey collectors, auctioneers and authenticators in the world – to go to work with his team to try and prove his hunch. The sweater was era appropriate for that Maple Leafs season. It was made by Rawlings. There was no name plate on the back. The style and positioning of the Leafs’ crests on the shoulders were correct. The font of Sittler’s ‘C’ on the front rang true to that season, with the extra serif on the end. But Meisel and MeiGray Group needed more. Last week, Meisel flew to Toronto to utilize the Hockey Hall of Fame’s sprawling resource centre for a near-forensic investigation. He needed one photo from the game to tie all of the facts together. Meisel sat there at the MasterCard Centre for Hockey Excellence at a light table and examined them all. Three unique characteristics matched the sweater in that photo to the sweater Meisel had in his possession: the slanted stem on the Maple Leaf crest on Sittler’s jersey; a hanging white thread on the ‘7’ on Sittler’s right jersey sleeve; and most importantly, a white blemish – or ‘board burn’ as they say in the industry – clearly visible on the blue of Sittler’s left jersey sleeve. “We knew we had the jersey,” Meisel said. MeiGray Group gave their stamp of authenticity on the jersey last Friday, just days before Wednesday’s 42nd anniversary of that historic night at Maple Leaf Gardens. All these years later, Sittler himself said he wondered. He didn’t know what happened to it after he took it off that night. He said in a text message to TSN it was “good to hear” it turned up again. Sittler will be in attendance at Air Canada Centre on Wednesday when the Leafs host Nashville. The story goes that Leafs owner Harold Ballard gifted it to someone after that game. It remained in private collections for 42 years, changing hands four or five times before landing with Meisel. That it was also kept in “pretty, pretty good condition” over the years, arriving wrapped carefully in plastic, is somewhat of a miracle. In that era, players didn’t value sweaters as a piece of history, they more often kept pucks and sticks. Sweaters were reused, sometimes even in practice. When they were gifted or handed down, sometimes they were worn outside to go play pond hockey. No one, especially not the notoriously stingy Ballard, could’ve imagined then the value of Sittler’s sweater today. Paul Henderson’s game-worn jersey from the 1972 Summit Series clincher is the most prized jersey in hockey history; it sold for $1.27 million (U.S.) in 2012. 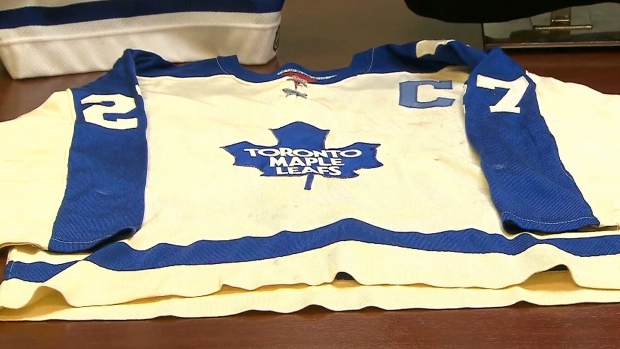 Meisel estimated Sittler’s sweater is worth approximately “25 to 50 per cent of that,” or “$350,000 to $500,000 U.S. dollars.” For Meisel, who has been collecting for more than three decades, this is a “Top 3” find. There are three reasons, Meisel said. For one: “This was a record Wayne Gretzky didn’t get. He re-wrote the record book, but not this one.” Two, it’s a record likely never to be broken. Today, a team collects 10 goals in one game once every other season, and the odds are astronomical to have one player factor into all 10 of those goals. Finally, Sittler’s sweater has personality, with blood splatter and repaired holes. Meisel said he is open to selling Sittler’s famed sweater, but he wants to consider all his options first. This 42-year-old relic isn’t just a collector's item. It’s a living, breathing piece of Toronto Maple Leafs history.